1lb size shown for reference. Apoxie® Clay is a unique 2-part clay-like adhesive that combines the features and benefits of sculpting clay with the adhesive power of epoxy! Offering enhanced detail properties, plasticity, accuracy, and handling features to make this clay superior for modeling, assemblage art, stamping/impressions, & more. It’s easy to add sculpted details to nearly any clean surface! Compatible with all types of texture & sculpting tools. Accepts paints, stains & more for a variety of finishing options. Apoxie Clay is an excellent choice for made from scratch builds of things like heads and weapons for action figures. The Original Epoxy Clay for over 35 years! Clay-like consistency for enhanced details! Adheres to: Itself (in any stage of set up before or after curing), other epoxies, Porcelain, Ceramic, Metal, Vinyl Kits, Polymers, Hard Plastic, Foam, Fiberglass, Wood, & more! 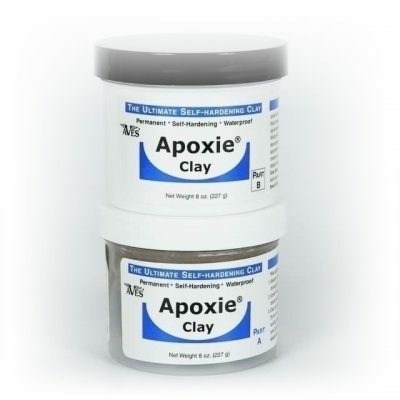 Apoxie® Clay is ready to use; working time is 1- 3 hours. Shape as desired. Smooth or texture with a wet finger, brush, Q-tip or sculpting tool. Self-hardens (NO BAKING); 24 hour full cure. Clean up: soap & water or Aves® Safety Solvent (very helpful for smoothing, removing finger prints & cleaning up pigment / product residue before set-up). Finish as desired. Paint wet or dry. Marine & Exterior Quality! *Wear protective gloves [e.g., nitrile or equivalent] when combining parts A and B. Wear a dust mask and safety glasses when sanding cured product…[P280] *Keep out of reach of children…[P102] *Safe for adults when used as directed. 24 hr. full cure required for hard finishing purposes such as sanding, carving, drilling, machining, etc., without chipping, cracking or flaking. Keep containers sealed when not in use. Freeze-Thaw-Stable. WARNING – H317 May cause an allergic skin reaction. H320 Causes eye irritation. CA Proposition 65 DANGER – contains crystalline silica known to be a human carcinogen via respiratory route. *Applies only to the cured clay product when sanded or abraded in some manner to create airborne dust. *Can be seamlessly feathered before set-up with a paint brush and the use of Aves® Safety Solvent for fine details; use water for smoothing large surface areas of your project. *If Apoxie® Clay is to sticky to work with at first, allow the product to sit/rest for 20 minutes, as time passes the product will be less sticky and more form-able for detail.